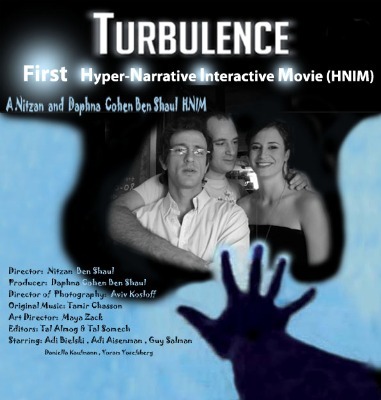 A poster for the interactive movie "Turbulence"
Ben-Shaul is not a technologist – he teaches classes in cinema studies at Tel Aviv University and has written several books including Mythical Expressions of Siege in Israeli Films and Hyper-Narrative Interactive Cinema: Problems and Solution. So to create his interactive movie, he partnered with Guy Avneyon who built a sophisticated patent-pending movie editor and standalone player. The technology is still under construction, as is the company. Turbulence (also the name of Ben-Shaul’s interactive film) is just now being incorporated and seeking angel investment. For Ben-Shaul, that’s less important. His focus is the process of thinking through the making of an interactive movie. Ben-Shaul points to the Gwyneth Paltrow hit Sliding Doors which presented two alternative paths that intersected, diverged and eventually arrived at a single conclusion. Turbulence the film is similar, except that the viewer controls the points of departure. The 83-minute suspense/thriller is about three friends who meet by chance in New York 20 years after they participated in a demonstration in Israel and were arrested. At the time, the police pitted the three against each other, which led to accusations of betrayal. There is also a love story that is rekindled. The interaction takes the form of “hot spots” that glow when the viewer can make a choice. At one point, for example, one of the Israelis has written a message to his lover on his cell phone. The viewer can click “Send” or “Cancel”. If the viewer hesitates too long, the action continues according to a pre-determined narrative path. 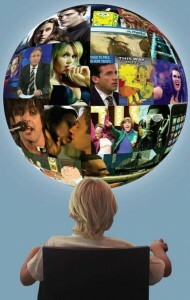 While viewers make choices throughout the viewing experience, the film regularly returns to the main narrative. This means the writers don’t have to create 10 entirely different scripts (although in Turbulence there are several alternate endings). Ben-Shaul is adamant that interactivity is not a gimmick – like the first attempts at 3D in the 1950s and 1960s. But he warns that interactive films must be carefully planned to avoid the errors of more primitive experiments in the past. These mistakes include what he refers to as the ‘computerization trap’. “Computers can generate endless possibilities, but that doesn’t help the viewer in terms of drama. It interests computers, but not humans!” he says. Good interactive drama, he adds, is actually about “option restriction”. Turbulence can currently be viewed on either a Mac or PC. But Ben-Shaul is most excited about the red-hot Apple iPad. With its touch screen and media consumption emphasis, “it’s the perfect device. The iPad is a main target,” Ben-Shaul says. The technological secret behind the film comprises an editor that will be familiar to anyone who’s ever created a movie, with a timeline, audio control, and multiple tracks. There are various additions such as a library of clips and hot spots that can be easily inserted. The aim is to sell a standalone version as well as plug-ins for professional editing systems such as Final Cut Pro, Adobe Premiere and Avid. Ben-Shaul and his team are also developing a scriptwriting tool that will ease the creation of a hyper-narrative. Turbulence isn’t the only software company making interactive movies. Israeli alternative rock sensation Yoni Bloch owns a company called Interlude, which is moving in the same direction. Earlier this year, Interlude produced a music video by pop singer Andy Grammar that includes seamless interactivity. YouTube also has its own very simple interactive functionality. Ben-Shaul acknowledges the competition but says his system is further along, not to mention patented. Turbulence also gives viewers the ability to actually move an object on screen (for example, to slide a letter out of a drawer) rather than just click or touch a point on the screen. 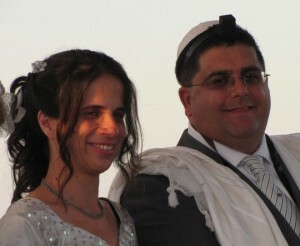 In a demonstration of the interactivity at the showing, Ben-Shaul’s wife (who also works at the company) canvassed the audience at each decision point. Ben-Shaul then clicked the viewer’s choice from his computer backstage. Ben-Shaul hopes to show Turbulence in Israel, perhaps at one of the country’s Cinematheques, though nothing has been finalized yet. For now, interactive movie fans will have to visit Ben-Shaul in his office at Tel Aviv University or watch a TV news clip and interview with Ben-Shaul on Israel’s Channel 10 which provides a hint of the richness of interactive moviemaking. I wrote in an earlier post about how human beings aren’t built to truly multitask – an action we increasingly rely on to parse all the data coming at us from the web or our mobile devices. New research is trying to figure out not only what happens psychologically when we try to do two things at once, but whether our brain neurology is being re-mapped by our incessant use of technology. The preliminary answer seems to be yes, and it’s not necessarily good news. New York Times technology journalist Matt Richtel participated earlier this year and is now writing about a unique week-long backpacking trip undertaken by a group of scientists where gadgets were banned and their itinerary took them far out of the range of cell phones. Would these highly connected researchers act – no, think – differently in such a situation, he asks? But all of the scientists noticed that they began to feel more relaxed and more engaged in the world. They slept a little better; waited a bit longer before answering a question. “You don’t feel in (such) a rush to do anything, your sense of urgency fades,” Richtel says. But only after three days – that was the amount of time for the disconnect effect to kick in. This might explain why we feel more relaxed after a three-day weekend as opposed to a “normal” two-day break from work. Why is this the case? A laboratory study had rats learning new tasks. When the rats were given time away from the task to process it, the action moved into memory and real long-term learning took place. Without that down time, the rats were more prone to forget what they’d just done. We can extrapolate that, Richtel says, to our contemporary lives, where we rarely give ourselves a break. If we’re waiting for an appointment and the person we’re meeting is late, what do we do? We pull out our smart phone and check email, text, browse the Internet or play a game. Even people without smart phones may listen to music on an iPod. What we need to do, Richtel claims, is simply “be,” to not fill every moment with something electronic, to let the learning consolidate in our brains. Richtel is certainly not advocating a ban on technology. He is adamant that our use of the web and mobile devices has made us more productive – he uses the example of using a Google map to find an address than having to call the person and write down directions – and he readily admits he couldn’t survive the 21st century without his addictions. And addiction it is. Why do you feel compelled to check email constantly, for example? Because you never know when there will be something exciting coming in. Each new message gives the brain a squirt of dopamine. If you had advance warning that interesting messages would only be delivered at 4:00 PM, you’d be less inclined to alt-tab to Gmail throughout the day. Indeed, The New York Times reports that the average computer user checks 40 websites a day and can switch programs 36 times an hour! Technology is like food, he posits. You need to eat and there’s no reason not to appreciate tasty (and hopefully nutritious) meals. But “we know that some food is Twinkies and some food is Brussels sprouts,” Richtel quips. And we’re well aware that you can also over-eat which has obvious negative consequences. What about our teenagers who are growing up on ubiquitous screens, frantically checking Facebook, email, tweets, chat and Skype wherever they are? Will their brains look different than those of us who had to go into the living room to get access to a screen (the television)? The research is pointing to yes. Our brains are elastic, Richtel explains. It’s not as if our ways of processing information is fixed at birth and never changes. Each new technology modifies the neural pathways, in particular the frontal lobe which is the last to develop. How it does that is the subject of upcoming research which Richtel will be writing about later this year. While our 17-year-old daughter Merav was away on a school trip to Poland this summer, she made a point of not checking in online. 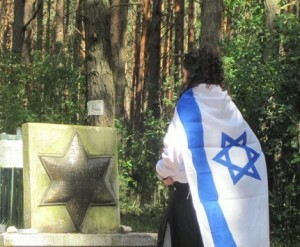 Merav’s experience in Poland, visiting lost Jewish communities and crying at the concentration camps, was intense – “difficult but meaningful” is how she described it upon her return home. Was her level of engagement different than her peers, many of whom were texting away at the dinner table? It would be presumptuous for me to make such a claim. But it’s undeniable that our use of technology profoundly affects us. I, for one, am looking forward to the Jewish holidays this year – Rosh Hashana and Shabbat coincide in such a way that those who observe the High Holy Days according to a more strict interpretation of Jewish law will have a full three days of enforced technology deprivation. I wonder how I’ll feel on the other side? Matt Richtel received the Pulitzer Prize in 2010 for a series in The New York Times on driving while multitasking. A shorter version of this article appeared on Israelity. A couple of weeks ago, we attended the wedding of good friends, Sammie and Isaac. The wedding was a blast with all the usual features of Israeli nuptials: chuppah, dancing, speeches and those greasy fried “cigars” stuffed with minced meat (of which I always partake too heartily). There was one element, though, that I’ve never seen before (although maybe I’m just not invited to the right weddings). Prior to the simcha, the couple sent out an email that announced that, for those who couldn’t attend, the evening would be broadcast live over the Internet. Now, live web streaming is nothing new and there are plenty of vendors eager to upgrade you to a “pro” account – Ustream and Livestream are just a couple that come to mind. I often catch up live online with TechAviv, a hi-tech group that meets monthly in the Tel Aviv area, when I’m feeling too lazy to hoof it over from Jerusalem. But I haven’t seen the technology used for a wedding. The way it worked was a bit funky: one of the wedding guests had set up a small laptop with a built in camera and microphone facing the chuppah. When he wanted to pan around the crowd, he picked up the whole laptop and did a 360. Since he had plugged the laptop into a 3G wireless card (I guess the wedding hall’s WiFi wasn’t dependable), he was able to later walk around the dance floor, as well as grab shots of guests chowing down at each of the tables – although with that brick of a broadcast unit, he wasn’t quite as nimble as a wedding photographer. This isn’t state-of-the-art yet: the sound was muddled and the video not up to TV network quality (or even watered down YouTube, for that matter), but it’s still a great idea, not just for family that can’t make it from overseas but local guests for whom a time conflict may preclude in-person attendance. And the coolest part: the video is still online. So even guests who were there can catch a glimpse of themselves doing the chicken dance. If you want to view some of Sammie & Isaac’s wedding, here’s the link. This piece appeared originally on the Israelity blog. A new study from the Kaiser Family Foundation confirms what most parents already know: that our kids are literally tethered to the Internet or other means of consuming media the better part of the day. The report, which has been the talk of the blogosphere since it was released yesterday, found that children and young adults aged 8 to 18 spend more than seven and a half hours a day on their computers, in front of a television, or accessing media on a smart phone or mobile device. That number doesn’t include talking or texting on a cell phone (another two hours a day). And if you calculate in multitasking – i.e., surfing the web while listening to music – the amount of media content taken in comes to nearly 11 hours total per day. The shocking part is that when the same study was conducted five years ago, its authors concluded that media use could not possibly grow further from the six and a half hours clocked in 2004. Roberts and crew were apparently wrong. The study’s results come as no surprise to my wife and I. All three of our children have their own computers, which are constantly on even while “studying.” The older two also have an iPhone and iPod Touch and know where all the open WiFi hotspots are in town. If they have a long bus ride, they load up the latest episodes of How I Met Your Mother or Dexter before leaving in the morning. While the amount of time teenagers spend online or watching TV or movies is surprisingly high, it’s not like we didn’t do the same when we were younger – at least as much as we could with the technology of the times. I distinctly remember my parents complaining that I couldn’t possibly study properly with music or the TV on. But my grades came out fine. That’s not necessarily the case today, though. The grades of 47 percent of the heaviest media users in the report were C or lower. Those heavy media users were also more likely to report that they were bored or sad, that they got into trouble, didn’t get along well with their parents, or were not happy at school. A number of years ago – before the advent of all the latest hi-tech toys – our kids had become hopelessly addicted to the tube. We took the radical step of going “cold turkey” and forbidding television entirely. The kids were mortified at first, but tell us today that it was one of the best things we did as parents. But their TV watching is now just as high – if not higher – than when we first detoxed; it’s simply not in the living room anymore. We have thought about taking their laptops away, but the kids have moaned that they need them for schoolwork – which is true. And then there is the role model of their parents. Both my wife and I are in front of our respective computers constantly. And we multitask too. I am constantly flitting between Firefox, to Word for an article I’m writing, to splicing in a few stolen minutes of The Office or Flash Forward – all the while listening to Internet radio or some of the 100 GB of music on our shared home server. So how can we criticize our children when their parents are equally guilty? The one thing that ruffles a teenager’s feathers more than anything else is perceived hypocrisy. And there have been certain benefits to the always-on society we’ve created. When my son was visiting Poland with his high school class, he found a WiFi connection at the Auschwitz concentration camp and Skyped me from there, bringing me into his experience without paying a penny. Ultimately, there’s no turning back. Our kids aren’t going to unplug and this is probably just an interim stage on the way to even more insidious connectivity. Someday, we’ll probably be able to pipe the Internet directly into our brains. What are we going to do then? Threaten to remove their batteries? If Apple has anything to do with it, the power supply will be hard wired in – like all of Apple’s iPod products. Need a new chip? Just replace your head. 76% of 8 to 18-year-olds have MP3 players (up from 18% in 2004). 64% say the TV is usually on during meals and 45% say the TV is left on “most of the time” even if no one is watching. The amount of time spent watching regularly scheduled TV declined by 25 minutes a day from 2004. But factoring in TV on the web and cell phones, total TV consumption increased from 3:51 hours to 4:29 hours a day. 74% say they have a profile on a social networking site. Respondents to the survey spend an average of 1:35 hours a day sending or receiving texts.